The notion that exercise reduces blood glucose levels is widespread. That notion is largely incorrect. Exercise appears to have a positive effect on insulin sensitivity in the long term, but also increases blood glucose levels in the short term. That is, exercise, while it is happening, leads to an increase in circulating blood glucose. In normoglycemic individuals, that increase is fairly small compared to the increase caused by consumption of carbohydrate-rich foods, particularly foods rich in refined carbohydrates and sugars. The figure below, from the excellent book by Wilmore and colleagues (2007), shows the variation of blood insulin and glucose in response to an endurance exercise session. The exercise session’s intensity was at 65 to 70 percent of the individuals’ maximal capacity (i.e., their VO2 max). The session lasted 180 minutes, or 3 hours. The full reference to the book by Wilmore and colleagues is at the end of this post. As you can see, blood insulin levels decreased markedly in response to the exercise bout, in an exponential decay fashion. Blood glucose increased quickly, from about 5.1 mmol/l (91.8 mg/dl) to 5.4 mmol/l (97.2 mg/dl), before dropping again. Note that blood glucose levels remained somewhat elevated throughout the exercise session. But, still, the elevation was fairly small in the participants, which were all normoglycemic. A couple of bagels would easily induce a rise to 160 mg/dl in about 45 minutes in those individuals, and a much larger “area under the curve” glucose response than exercise. So what is going on here? Shouldn’t glucose levels go down, since muscle is using glucose for energy? No, because the human body is much more “concerned” with keeping blood glucose levels high enough to support those cells that absolutely need glucose, such as brain and red blood cells. During exercise, the brain will derive part of its energy from ketones, but will still need glucose to function properly. In fact, that need is critical for survival, and may be seen as a bit of an evolutionary flaw. Hypoglycemia, if maintained for too long, will lead to seizures, coma, and death. Muscle tissue will increase its uptake of free fatty acids and ketones during exercise, to spare glucose for the brain. And muscle tissue will also consume glucose, in part for glycogenesis; that is, for making muscle glycogen, which is being depleted by exercise. In this sense, we can say that muscle tissue is becoming somewhat insulin resistant, because it is using more free fatty acids and ketones for energy, and thus less glucose. Another way of looking at this, however, which is favored by Wilmore and colleagues (2007), is that muscle tissue is becoming more insulin sensitive, because it is still taking up glucose, even though insulin levels are dropping. Truth be told, the discussion in the paragraph above is mostly academic, because muscle tissue can take up glucose without insulin. Insulin is a hormone that allows the pancreas, its secreting organ, to communicate with two main organs – the liver and body fat. (Yes, body fat can be seen as an “organ”, since it has a number of endocrine functions.) Insulin signals to the liver that it is time to take up blood glucose and either make glycogen (to be stored in the liver) or fat with it (secreting that fat in VLDL particles). Insulin signals to body fat that it is time to take up blood glucose and fat (e.g., packaged in chylomicrons) and make more body fat with it. Low insulin levels, during exercise, will do the opposite, leading to low glucose uptake by the liver and an increase in body fat catabolism. Resistance exercise (e.g., weight training) induces much higher glucose levels than endurance exercise; and this happens even when one has fasted for 20 hours before the exercise session. The reason is that resistance exercise leads to the conversion of muscle glycogen into energy, releasing lactate in the process. Lactate is in turn used by muscle tissues as a source of energy, helping spare glycogen. It is also used by the liver for production of glucose through gluconeogenesis, which significantly elevates blood glucose levels. That hepatic glucose is then used by muscle tissues to replenish their depleted glycogen stores. This is known as the Cori cycle. Exercise seems to lead, in the long term, to insulin sensitivity; but through a fairly complex and longitudinal process that involves the interaction of many hormones. One of the mechanisms may be an overall reduction in insulin levels, leading to increased insulin sensitivity as a compensatory adaptation. In the short term, particularly while it is being conducted, exercise nearly always increases blood glucose levels. Even in the first few months after the beginning of an exercise program, blood glucose levels may increase. If a person who was on a low carbohydrate diet started a 3-month exercise program, it is quite possible that the person’s average blood glucose would go up a bit. If low carbohydrate dieting began together with the exercise program, then average blood glucose might drop significantly, because of the acute effect of this type of dieting on average blood glucose. Still exercise is health-promoting. The combination of the long- and short-term effects of exercise appears to lead to an overall slowing down of the progression of insulin resistance with age. This is a good thing. Tripe dishes are made with the stomach of various ruminants. The most common type of tripe is beef tripe from cattle. Like many predators, our Paleolithic ancestors probably ate plenty of offal, likely including tripe. They certainly did not eat only muscle meat. It would have been a big waste to eat only muscle meat, particularly because animal organs and other non-muscle parts are very rich in vitamins and minerals. The taste for tripe is an acquired one. Many national cuisines have traditional tripe dishes, including the French, Chinese, Portuguese, and Mexican cuisines – to name only a few. The tripe dish shown in the photo below was prepared following a simple recipe. Click on the photo to enlarge it. - Cut up about 2 lbs of tripe into rectangular strips. I suggest rectangles of about 5 by 1 inches. - Boil the tripe strips in low heat for 5 hours. - Drain the boiled tripe strips, and place them in a frying or sauce pan. You may use the same pan you used for boiling. - Add a small amount of tomato sauce, enough to give the tripe strips color, but not to completely immerse them in the sauce. Add seasoning to taste. I suggest some salt, parsley, garlic powder, chili powder, black pepper, and cayenne pepper. - Cook the tripe strips in tomato sauce for about 15 minutes. Cooked tripe has a strong, characteristic smell, which will fill your kitchen as you boil it for 5 hours. Not many people will be able to eat many tripe strips at once, so perhaps this should not be the main dish of a dinner with friends. I personally can only eat about 5 strips at a time. I know folks who can eat a whole pan full of tripe strips, like the one shown on the photo in this post. But these folks are not many. In terms of nutrition, 100 g of tripe prepared in this way will have approximately 12 g of protein, 4 g of fat, 157 g of cholesterol, and 2 g of carbohydrates. You will also be getting a reasonable amount of vitamin B12, zinc, and selenium. Many people think that the prettiest faces are those with very unique features. Generally that is not true. Pretty faces are average faces. And that is not only because they are symmetrical, even though symmetry is an attractive facial trait. Average faces are very attractive, which is counterintuitive but makes sense in light of evolution and genetics. The faces in the figure below (click to enlarge) are from a presentation I gave at the University of Houston in 2008. The PowerPoint slides file for the presentation is available here. The photos were taken from the German web site Beautycheck.de. This site summarizes a lot of very interesting research on facial attractiveness. The face on the right is a composite of the two faces on the left. It simulates what would happen if you were to morph the features of the two faces on the left into the face on the right. That is, the face on the right is the result of an “averaging” of the two faces on the left. If you show these photos to a group of people, like I did during my presentation in Houston, most of the people in the group will say that the face on the right is the prettiest of the three. This happens even though most people will also say that each of the three faces is pretty, if shown each face separately from the others. Why are average faces more beautiful? The reason may be that we have brain algorithms that make us associate a sense of “beauty” with features that suggest an enhanced resistance to disease. This is an adaptation to the environments our ancestors faced in our evolutionary past, when disease would often lead to observable distortions of facial and body traits. Average faces are the result of increased genetic mixing, which leads to increased resistance to disease. This interpretation is a variation of Langlois and Roggman’s “averageness hypothesis”, published in a widely cited 1990 article that appeared in the journal Psychological Science. By the way, many people think that the main survival threats ancestral humans faced were large predators. I guess it is exciting to think that way; our warrior ancestors survived due to their ability to fight off predators! The reality is that, in our ancestral past, as today, the biggest killer of all by far was disease. The small organisms, the ones our ancestors couldn’t see, were the most deadly. People from different populations, particularly those that have been subjected to different diseases, frequently carry genetic mutations that protect them from those diseases. Those are often carried as dominant alleles (i.e., variations of a gene). When two people with diverse genetic protections have children, the children inherit the protective mutations of both parents. The more genetic mixing, the more likely it is that multiple protective genetic mutations will be carried. The more genetic mixing, the higher is the "averageness" score of the face. The opposite may happen when people who share many genes (e.g., cousins) have children. The term for this is inbreeding. Since alleles that code for diseases are often carried in recessive form, a child of closely related parents has a higher chance of having a combination of two recessive disease-promoting alleles. In this case, the child will be homozygous recessive for the disease, which will increase dramatically its chances of developing the disease. In a nutshell: gene mixing = health; inbreeding = disease. Finally, if you have some time, make sure to take a look at this page on the Virtual Miss Germany! Many sports combine three key elements that make them excellent fitness choices: play, resistance exercise, and endurance exercise; all at the same time. Soccer is one of those sports. Its popularity is growing, even in the US! The 2010 FIFA World Cup, currently under way in South Africa, is a testament to that. It helps that the US team qualified and did well in its first game against England. 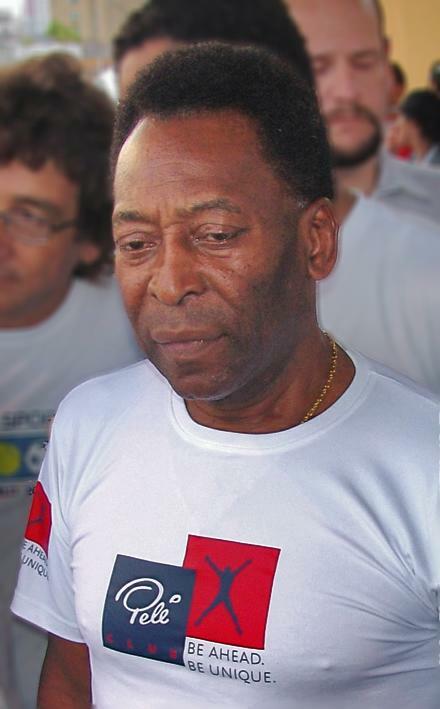 Pelé is almost 70 years old in the photo below, from Wikipedia. He is widely regarded as the greatest soccer player of all time. But not by Argentineans, who will tell you that Pelé is probably the second greatest soccer player of all time, after Maradona. Even though Brazil is not a monarchy, Pelé is known there as simply “The King”. How serious are Brazilians about this? Well, consider this. Fernando Henrique Cardoso was one of the most popular presidents of Brazil. He was very smart; he appointed Pelé to his cabinet. But when Cardoso had a disagreement with Pelé he was broadly chastised in Brazil for disrespecting “The King”, and was forced to publicly apologize or blow his political career! Arguably soccer is a very good choice of play activity to be used in combination with resistance exercise. When used alone it is likely to lead to much more lower- than upper-body muscle development. Unlike before the 1970s, most soccer players today use whole body resistance exercise as part of their training. Still, you often see very developed leg muscles and relatively slim upper bodies. What leads to leg muscle gain are the sprints. Interestingly, it is the eccentric part of the sprints that add the most muscle, by causing the most muscle damage. That is, it not the acceleration, but the deceleration phase that leads to the largest gains in leg muscle. This eccentric phase effect is true for virtually all types of anaerobic exercise, and a well known fact among bodybuilders and exercise physiologists (see, e.g., Wilmore et al., 2007; full reference at the end of the post). For example, it is not the lifting, but the lowering of the bar in the chest press, which leads to the most muscle gain. Like many sports practiced at high levels of competition, professional soccer can lead to serious injuries. So can non-professional, but highly competitive play. Common areas of injury are the ankles and the knees. See Mandelbaum & Putukian (1999) for a discussion of possible types of health problems associated with soccer; it focuses on females, but is broad enough to serve as a general reference. The full reference and link to the article are given below. Mandelbaum, B.R., & Putukian, M. (1999). Medical concerns and specificities in female soccer players. Science & Sports, 14(5), 254-260. Excessive dietary fructose has been shown to cause an unhealthy elevation in serum triglycerides. This and other related factors are hypothesized to have a causative effect on the onset of the metabolic syndrome. Since fructose is found in fruits (see table below, from Wikipedia; click to enlarge), there has been some concern that eating fruit may cause the metabolic syndrome. Vegetables also have fructose. Sweet onions, for example, have more free fructose than peaches, on a gram-adjusted basis. Sweet potatoes have more sucrose than grapes (but much less overall sugar), and sucrose is a disaccharide derived from glucose and fructose. Sucrose is broken down to fructose and glucose in the human digestive tract. Dr. Robert Lustig has given a presentation indicting fructose as the main cause of the metabolic syndrome, obesity, and related diseases. Yet, even he pointed out that the fructose in fruits is pretty harmless. This is backed up by empirical research. The problem is over-consumption of fructose in sodas, juices, table sugar, and other industrial foods with added sugar. Table sugar is a concentrated form of sucrose. In these foods the fructose content is unnaturally high; and it comes in an easily digestible form, without any fiber or health-promoting micronutrients (vitamins and minerals). Dr. Lustig’s presentation is available from this post by Alan Aragon. At the time of this writing, there were over 450 comments in response to Aragon’s post. If you read the comments you will notice that they are somewhat argumentative, as if Lustig and Aragon were in deep disagreement with one other. The reality is that they agree on a number of issues, including that the fructose found in fruits is generally healthy. Fruits are among the very few natural plant foods that have been evolved to be eaten by animals, to facilitate the dispersion of the plants’ seeds. Generally and metaphorically speaking, plants do not “want” animals to eat their leaves, seeds, or roots. But they “want” animals to eat their fruits. They do not “want” one single animal to eat all of their fruits, which would compromise seed dispersion and is probably why fruits are not as addictive as doughnuts. From an evolutionary standpoint, the idea that fruits can be unhealthy is somewhat counterintuitive. Given that fruits are made to be eaten, and that dead animals do not eat, it is reasonable to expect that fruits must be good for something in animals, at least in one important health-related process. If yes, what is it? Well, it turns out that fructose, combined with glucose, is a better fuel for glycogen replenishment than glucose alone; in the liver and possibly in muscle, at least according to a study by Parniak and Kalant (1988). A downside of this study is that it was conduced with isolated rat liver tissue; this is a downside in terms of the findings’ generalization to humans, but helped the researchers unveil some interesting effects. The full reference and a link to the full-text version are at the end of this post. The Parniak and Kalant (1988) study also suggests that glycogen synthesis based on fructose takes precedence over triglyceride formation. Glycogen synthesis occurs when glycogen reserves are depleted. The liver of an adult human stores about 100 g of glycogen, and muscles store about 500 g. An intense 30-minute weight training session may use up about 63 g of glycogen, not much but enough to cause some of the responses associated with glycogen depletion, such as an acute increase in adrenaline and growth hormone secretion. Liver glycogen is replenished in a few hours. Muscle glycogen takes days. Glycogen synthesis is discussed at some length in this excellent book by Jack H. Wilmore, David L. Costill, and W. Larry Kenney. That discussion generally assumes no blood sugar metabolism impairment (e.g., diabetes), as does this post. If one’s liver glycogen tank is close to empty, eating a couple of apples will have little to no effect on body fat formation. This will be so even though two apples have close to 30 g of carbohydrates, more than 20 g of which being from sugars. The liver will grab everything for itself, to replenish its 100 g glycogen tank. In the Parniak and Kalant (1988) study, when glucose and fructose were administered simultaneously, glycogen synthesis based on glucose was increased by more than 200 percent. Glycogen synthesis based on fructose was increased by about 50 percent. In fruits, fructose and glucose come together. Again, this was an in vitro study, with liver cells obtained after glycogen depletion (the rats were fasting). Parniak, M.A. and Kalant, N. (1988). Enhancement of glycogen concentrations in primary cultures of rat hepatocytes exposed to glucose and fructose. Biochemical Journal, 251(3), 795–802. Cortisol is a hormone that plays several very important roles in the human body. Many of these are health-promoting, under the right circumstances. Others can be disease-promoting, especially if cortisol levels are chronically elevated. Among the disease-promoting effects of chronically elevated blood cortisol levels are that of excessive gluconeogenesis, causing high blood glucose levels even while a person is fasting. This also causes muscle wasting, as muscle tissue is used to elevate blood glucose levels. Cortisol also seems to transfer body fat from subcutaneous to visceral areas. Presumably cortisol promotes visceral fat accumulation to facilitate the mobilization of that fat in stressful “fight-or-flight” situations. Visceral fat is much easier to mobilize than subcutaneous fat, because visceral fat deposits are located in areas where vascularization is higher, and are closer to the portal vein. The problem is that modern humans often experience stress without the violent muscle contractions of a “fight-or-flight” response that would have normally occurred among our hominid ancestors. Arguably those muscle contractions would have normally been in the anaerobic range (like a weight training set) and be fueled by both glycogen and fat. Recovery from those anaerobic "workouts" would induce aerobic metabolic responses, for which the main fuel would be fat. Coates and Herbert (2008) studied hormonal responses of a group of London traders. Among other interesting results, they found that a trader’s blood cortisol level rises with the volatility of the market. The figure below (click to enlarge) shows the variation in cortisol levels against a measure of market volatility. On a day of high volatility cortisol levels can be significantly higher than those on a day with little volatility. The correlation between cortisol levels and market volatility in this study was a very high 0.93. This is almost a perfectly linear association. Market volatility is associated with traders’ stress levels; stress that is experienced without heavy physical exertion. Cortisol levels go up a lot with stress. And modern humans live in hyper-stressful environments. Unfortunately stress in modern urban environments is often experienced while sitting down. In the majority of cases stress is experienced without any vigorous physical activity in response to it. As Geoffrey Miller pointed out in his superb book, The Mating Mind, the lives of our Paleolithic ancestors would probably look rather boring to a modern human. But that is the context in which our endocrine responses evolved. Our insatiable appetite for over stimulation may be seen as a disease. A modern disease. A disease of civilization. Well, it is no wonder that heavy physical activity is NOT a major trigger of death by sudden cardiac arrest. Bottled up modern human stress likely is. We need to learn how to make stress management techniques work for us. Visiting New Zealand at least once and watching this YouTube video clip often to remind you of the experience does not hurt either! Note the “honesty box” at around 50 seconds into the clip. Coates, J.M., & Herbert, J. (2008). Endogenous steroids and financial risk taking on a London trading floor. Proceedings of the National Academic of Sciences of the U.S.A., 105(16), 6167–6172. Many people assume that growth hormone secretion drops with age in a somewhat linear fashion, as implied by this diagram. This assumption probably stems from attempts to model growth hormone variations with linear regression algorithms. This assumption is wrong. Actual plots of growth hormone secretion patterns, with age on the horizontal axes, tell a different story. See, for example, the graphs below, from professionalmuscle.com. They match the graphs one sees in empirical academic papers. The graphs below (click to enlarge) are particularly good at highlighting some interesting patterns of variation. On the left side, bar charts show secretion patterns grouped by age ranges during a 24 h period (at the top), during wake time (at the middle), and during sleep (at the bottom). On the right side is the actual data used to build the bar charts. As you can see from the graphs on the right side, the drop in growth hormone secretion follows a pattern that looks a lot more like an exponential decay than a linear pattern. The drop is very steep from 15 to 40 years of age, after which it shows some fluctuations, going up and down. Interestingly, people in their 50s and 60s, at least in this dataset, have on average higher growth hormone levels than people in their 40s. Of course this may be due to sample bias, but the graphs suggest that there is a major drop in growth hormone secretion, on average, around age 45. As you can see, there is a lot of individual variation in growth hormone levels. If you look carefully at the graph on the top-right corner, you will see a 50 year old who has a higher 24 h growth hormone secretion than many folks in 15-30 age range. This pattern of individual variation is common for the vast majority of traits anyway, and often the distribution of traits follows a normal, or bell-shaped, distribution. The bell-shaped distribution becomes clear when the traits are plotted based on frequency. Growth hormone is secreted in pulses. In case you are wondering, growth hormone secretion in young women is higher than in young men. See the graphs below (click to enlarge), from this excellent article on growth hormone by Cummings and Merrian. Yet, women do not put on a lot of muscle mass in response to weight training, regardless of the age at which they do weight training. This means that growth hormone, by itself, does not lead to significant gains in muscle mass. Androgenic hormones, like testosterone, play a key moderator role here. Muscle mass gain is the result of a number of things, including the combined action of various hormones. To complicate things further, not only do these hormones act together in an additive fashion, but they also influence each other. Another reasonable conclusion from the data above on growth hormone secretion in young women and men is that growth hormone must indeed have major health-promoting effects, as most of the empirical data suggests. The reason is that, from an evolutionary standpoint, young (or pre-menopausal) women have always been the evolutionary bottleneck of any population of ancestral hominids. High survival rates among young women were a lot more important than high survival rates among men in general, in terms of the chances of survival of any population of ancestral hominids. Higher survival rates among young ancestral women may have been enabled by higher levels of growth hormone, among other things. The onset of the metabolic syndrome, which is frequently in modern humans around age 45, may also be strongly influenced by falling growth hormone levels. How can growth hormone secretion be increased after age 45? One obvious option is vigorous exercise, particularly resistance exercise. Cortisol is a hormone that does a number of different things; a jack of all trades among hormones, so to speak. It tells the liver to produce glucose, preventing hypoglycemia. It also tells the liver to synthesize glycogen, which is in some ways the opposite of producing glucose. It tells the stomach to secret gastric acid. It is an anti-diuretic hormone. It suppresses the immune system, which is why it is frequently used to reduce inflammation, and treat allergies and various autoimmune diseases. It jump-starts an increase in free fatty acids in circulation, thus helping provide an important source of energy for endurance exercise. Cortisol, together with epinephrine (a.k.a. adrenaline), even contributes to the creation of surprise-induced memories. It is because of this action of cortisol that Americans reading this post, especially those who lived in the East Coast in 2001, remember vividly where they were, what they were doing, and who they were with, when they first heard about the September 11, 2001 Attacks. I was living in Philadelphia at the time, and I remember those details very vividly, even though the Attacks happened almost 10 years ago. That is one of the fascinating things that cortisol does; it instantaneously turns short-term contextual memories temporally associated with a surprise event (i.e., a few minutes before and after the event) into long-term memories. Similarly to insulin, you don’t want cortisol levels to be more elevated than they should naturally be. Natural levels being those experienced by our hominid ancestors on a regular basis. You need cortisol, but you don’t need too much of it. Many tissues in the body become resistant to hormones that are more elevated than they should be, like insulin and leptin, and this is also true for cortisol. It is a bit like people constantly shouting in your ears; after a while you cover your ears, or they get damaged, so people have to shout louder. If you frequently have acute elevations of cortisol levels, they may become chronically elevated due to cortisol resistance. Chronically elevated cortisol levels are associated with the metabolic syndrome, the hallmark of the degenerative diseases of civilization. Stress causes elevated cortisol levels. And those levels are significantly elevated if you consume foods that lead to a high blood glucose response after a meal. That is what an interesting experimental study by Gonzalez-Bono and colleagues (2002) suggests. The full reference and link to the study are at the end of this post. They used glucose, but we can reasonably conclude based on glucose metabolism research that foods rich in refined carbohydrates and sugars would have a very similar effect. If we think about the typical American breakfast, possibly even a stronger effect. In order to do their study they needed to put the participants under stress. To cause stress the researchers did what many college professors have their students do at the end of the semester, which is also something that trial lawyers and preachers are good at, and something that most people hate doing. You guessed it. The researchers had their subjects do, essentially, some public speaking. The experimental task they used was a variation of the “Trier Social Stress Test” (TSST). The researchers asked the participants to conduct a 5-minute speech task and a 5-minute mental arithmetic task in front of an audience. The participants were 37 healthy men who fasted for at least 8 h prior to the study. They were randomly assigned to one of four groups. The glucose group consumed 75 g of glucose dissolved in water. The fat group consumed 200 g of avocado. The protein group drank 83 g of proteins dissolved in water. The fourth group, the water group, drank plain water. From a real world perspective, the fat and protein groups, unlike the glucose group, were arguably overloaded with their respective nutrients. Many people would not normally consume that much fat or protein in one single meal. This makes the results even more interesting, because it seems that fat and protein lead to virtually the same response as water, regardless of the amount ingested. The table below shows the cortisol responses for all groups. As you can see, the cortisol response for the glucose group is a lot more elevated. How much more elevated? In the inner square at the top-left part of the figure you have the areas under the curve (AUC), which are essentially the estimates of the integrals of the cortisol curves for each of the groups. Usually AUC is a key measure when one looks at the potential negative impact of the elevated levels of a substance in the blood. Note that the cortisol AUC for the glucose group is much larger, about two times larger, than the cortisol AUCs for the other groups. When one has a morning car commute, what is going to happen? Typically cortisol levels will be elevated, unless the commute is uneventful and done completely on “automatic pilot”; which is not very common, as people cut off in front of each other, make irritating mistakes etc. What if, before that commute, one eats a “solid” breakfast with plenty of “healthy” sugary cereal covered with honey, a glass of “healthy” low-fat milk (of course, because fat “raises bad cholesterol”), and maybe three pancakes covered with syrup? Cortisol levels will be much more elevated. Doing this often, maybe after several years a person will become eligible for death by sudden cardiac arrest while doing some light activity. Gonzalez-Bono, E., Rohleder, N., Hellhammer, D.H., Salvador, A., & Kirschbaum, C. (2002). Glucose but Not Protein or Fat Load Amplifies the Cortisol Response to Psychosocial Stress. Hormones and Behavior, 41(3), 328–333.